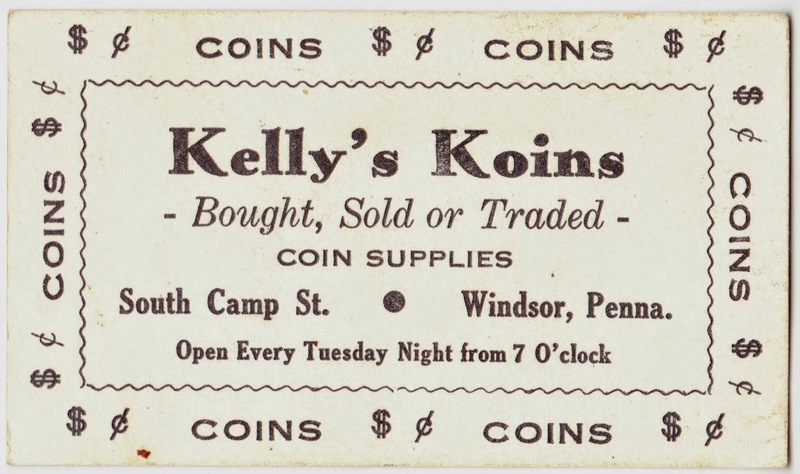 Here's a business-card-sized advertising card for Kelly's Koins in Windsor, Pennsylvania. There's no date. I'm guessing that it's probably from the 1950s or 1960s (based partially on the other ephemera that was with it). I cannot find any online mention of Kelly's Koins on South Camp Street in Windsor. The store, which bought, sold and traded coins and coin supplies, was only open every Tuesday night from 7 p.m. onward. That, you must admit, is a little odd. It almost makes you wonder whether this was more of a numismatics club than a full-fledged business. Interestingly, there is now a store called Ken's Koins in Red Lion, Pennsylvania. Red Lion is just two miles southwest of Windsor, so it's not too far-fetched to think that there might be some family relationship between the former Kelly's Koins and the current Ken's Koins. I'm also going to ask some longtime York County residents if they remember Kelly's Koins, so stay tuned.